Landfills are categorized by regulations in three types: industrial, municipal, and hazardous. Individual landfills may be further differentiated by the types of waste which they accept. All landfills are required to be capped, usually occurring at the end of each day. The cap is typically 6-8” of soil. The cap reduces odor and loss due to wind. At the closing of the landfill, a permanent cap consisting of a membrane and more soil is added. Before the landfilling operation begins, an “impermeable” base is required. This usually consists of two layers of membranes separated by at least 12” of sand. A network of drain pipes is buried in the sand. These pipes transport the wastewater that must be treated. Rain or groundwater infiltrating through the buried waste can dissolve solids and heavy metal salts. The aqueous leachate may also contain organic and inorganic chemicals from the decomposition of waste inside the landfill. While landfills within the same categories may have similar leachates, each landfill has its own fingerprint when it comes to pollutants. Testing is required to determine leachate composition and the exact treatment required. Some landfills produce a leachate with a high biochemical oxygen demand (BOD) and chemical oxygen demand (COD) together with a nitrogen component. These leachates may require biological treatment to achieve acceptable discharge levels. Some leachates contain heavy metals such has chrome, lead, and mercury. These require treatment for removal of these heavy metals. Sludge produced by this treatment will naturally contain heavy metals and will require hazardous waste disposal. 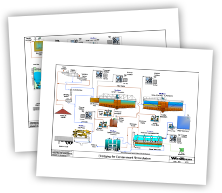 Treatment plant design considerations include site, landfilling techniques, cover and cap design, bottom isolation, collection design, landfill gas utilization, and onsite operation facilities. Depicted here is a basic system for the removal of suspended solids and organics. The system consists of clarification, filtration, and treatment by activated carbon. Clarification and filtration removes suspended solids and organics and acts as pretreatment for the activated carbon units. Clarifier underflow and backwash from the filters and activated carbon units flows to a thickener. The percent solids are increased in the final sludge stream which is sent to dewatering. If biological treatment is required, it precedes the clarification step. A portion of the clarifier underflow cycles back to the biological treatment system, enriching the microbial population. Heavy metals are removed downstream from the clarifier and upstream from the filter and activated carbon units. In this case, the filters and the activated carbon units become the polishing units to remove any trace solids and organics. Landfill gases also must be treated. If the gases are vented to the atmosphere, hazardous and noxious substances must be removed. Usually contacted carbon is used for this purpose. The gases contain methane and may be used as fuel. This usually requires several treatment steps which produce another set of liquid wastes to be treated. The number of contaminants and possible treatment methods for groundwater are vast. Physical, chemical, and biological treatment methods are all used with regularity. Concentrations of contaminants and regulations both vary widely. Biological treatment has proven to be a low cost and sustainable solution for many water treatment applications. Advantages of biological treatment include low energy consumption, little or no chemical addition requirement, and non-hazardous waste products. Operational challenges exist; balanced biological systems are easily disrupted, and are sensitive to physical and chemical conditions. Concentration may be necessary in some cases where biological treatment is desired. Solutions include ultrafiltration (UF), reverse osmosis (RO), ion exchange (IX), and electrodialysis reversal (EDR). If concentrations are low, the contaminated water can be filtered for suspended solids removal and then passed through activated carbon beds (see the VOC removal page for more information). A number of possibilities exist for concentrating solids to a level that is suitable for biological treatment including UF, RO, IX, and EDR. Evaluation of these processes is based on influent water quality, contaminant to be removed, and chemicals required for the biological process. Biological processes can be fixed-film or suspended growth. They may be aerobic or anaerobic with varying oxidation/reduction potential (ORP). A number of reactor types have been successfully utilized for biological reactions. These include aeration tanks, trickling filters, bio filters, and rotating biological contactors (RBC). The removal mechanism varies based on the contaminant. It may include substrate utilization, reduction, assimilation, or adsorption. Concentrated water characteristics may require addition of carbon sources, electron acceptors, or nutrients to facilitate biological growth. An effluent polishing step may be required. This is generally dictated by reactor configuration and effluent requirements. This step could include filtration, UF, RO, disinfection, chlorination, or UV. Dewatering has the advantage of waste solids weight reduction which reduces disposal costs. Dewatering can be accomplished by a number of technologies including belt press, filter press, and dewatering filters. Contaminated sediment is soil, sand, rocks, organic matter, or other minerals that accumulate on the bottom of a water body and contain toxic or hazardous materials at levels that may adversely affect human health, aquatic life, or the environment. Major contaminants include polychlorinated biphenyls (PCBs), metal hydroxides, mercury, pesticides, and herbicides. Contaminated sediment is typically dredged, then processed for contaminant removal and solids disposal. The solids are disposed of in a hazardous waste landfill. Many sites present unique challenges and require that site-specific conditions be considered when determining an appropriate site remedy and treatment flow plan. Initially, the dredge slurry passes through a screening process to remove coarse debris which is usually not hazardous. This process can include grizzly screens, washing trommels, vibrating screens, and hydrocyclones which remove large solids and reduce the load on the downstream treatment system. The liquid phase from this initial treatment is pumped to the deaeration tank prior to the thickener. This tank allows any entrained air to be released from the liquid. It is here that return streams rejoin the process. The remaining solids in the influent stream are coagulated and flocculated for removal in a thickener. Thickener effluent is further clarified in a Solids CONTACT CLARIFIER™ specially designed with a high internal recirculation rate for optimum flocculation and settlement of fine colloidal solids. The clarifier effluent is polished in a granular media filter to remove any remaining suspended solids. An equalization tank is provided ahead of the filter to allow for periodic filter shutdown and backwash. Wastewater flow stoppage is avoided by using a MULTICELL® Horizontal Pressure Filter. This filter design divides the filter into as many as eight (8) separate sections. Each section can function separately as an individual filter. This allows the use of the filtrate from multiple sections to be used as the backwash for a single section. The filter thus continues to receive inlet flow, while all of the filtered effluent becomes the backwash outlet flow. This backwash flow is directed to the thickener for solids removal and water recovery. Activated carbon units are used to remove any remaining volatile organic carbon (VOC). Many VOCs are human-made chemicals that are used and produced in the manufacture of paints, adhesives, petroleum products, pharmaceuticals, and refrigerants. They often are compounds of fuels, solvents, hydraulic fluids, paint thinners, and dry-cleaning agents commonly used in urban settings. VOC contamination of drinking water is a human health concern because many are toxic and are known or suspected human carcinogens. The solids from the thickener and the Solids CONTACT CLARIFIER™ are dewatered in a belt press or filter press. Solids which will contain toxic or otherwise hazardous materials are disposed of in hazardous waste landfills.